The weather forecast wasn't good, in fact it was terrible. But who would we be if we let that stand in the way of a Hood Half Climb? We hope for weather that is at least a little bit challenging, lest we start to think the mountain is a walk-up. But hovering right above freezing, and raining? Even I started to wonder, as I drove up in the downpour, whether this was just plain stupid. Even though we decided that the weather wasn't good for tents, most of us took the good advice to spend the night - or at least half the night - sleeping semi-comfortably in our cars. Wendy, Jed, Rebekah and myself even met for a leisurely beer in the Ram's Head Lounge before retiring for the night. 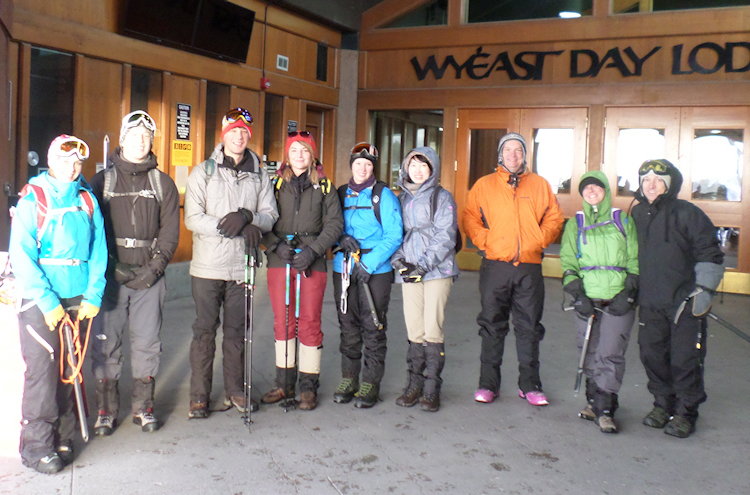 The weather hadn't miraculously improved by morning, but we all assembled about 5am and got ready to walk, retaining the hope that we could at least climb above the rain and enjoy a snowy day. Surprisingly, nobody chickened out due to the weather, and we would have been ready by our 5:30 departure time except that Evan and Kyirsty had some trouble finding the Climber's Cave, so we headed out about 6am. The weather started out rainy and then got better enough that we had a brief sun-break to enjoy a spectacular view of the valley. But it didn't last long - it disappeared right before our eyes, and within a few minutes, we were socked in again, though we were indeed above the rain, so had only driving snow and ice with which to contend. We only saw one other group on the mountain that day, a rather hardy crew that was descending just below the top of Palmer. They were well equipped and had made it to the summit, though I think it must have been a little more clear while they were ascending, or else they were just risk-takers. They seemed well-seasoned, and more than a little beat up from the climb. By the time we reached the top of Palmer, around 9:30, we were all iced over on the windward side, and had already dispensed several spare pairs of gloves. Most of us would have been ambitious enough to continue, but it was evident that if we didn't have the lift-line, we wouldn't be able to see anything at all, so it would be treacherous travel above that point. Some of our group were cold and tired, so they stayed behind, but I agreed to lead a small contingent just up a ways into the white-out, so we could see what it was like. Unfortunately, we had taken only a few steps into the fog when my GPS - which was our only lifeline without visibility - started to beep that it was low on batteries, and I had left the spares back in my pack. So I just led us in not-too-big a circle to the east, so that we would come back down on the cat-track that marks the top of the Palmer Snowfield, which I pretty much fell onto, the visibility was so poor. I think everybody was surprised to find us back at the lift after barely 10 minutes out, and I was prepared to change the batteries and head out again, but the consensus seemed to be that white-outs are pretty scary and dangerous and we all understood that from first-hand experience. So we descended, sticking to the lift line as our only visible guidance. Usually I depart from it on the descent, at around Silcox hut or so, and take the more direct climber's trail to the parking lot, but due to the visibility still being near zero, we just stuck to the lift line - and frankly, I don't know the topology of that area very well. I was pretty sure if we just stuck to the lift line we'd end up at the lodge, but everybody was ready to go home and not much up for more adventure. It all worked out, and without too much meandering we arrived back at the lodge at about 11:30am. And so it was that we all survived another Hood Half Climb, in just the right weather to really get to test out our gear and experience some mountain conditions, and even some actual white-out experience, under controlled conditions of course. I think everybody learned a little that would make them ready for a future climb, and everybody seemed to think it was a worthwhile experience. There should be link above, in the section "Your Status", to sign up as "Attending". Isn't it there? You're in! When I get a chance, I'm going to make that signup link a button or something so that people will notice it more easily! What time will we be starting? Somewhere around dawn. I'll leave it to the group to decide exactly - whether we want to start in the dark like a real Hood climb, or take it more leisurely. Can I park overnight in the lot at Timberline where we parked on training day? Yes, you should be able to park there or in the main lot. Sometimes they close different parts to plow, but there is always somewhere. Hey Hood-halfers, I just opened the event for 'verifying', which (if you're new to this) means that a box shows up above asking you to update your contact details for the event, and to click the button so we know you're paying attention and still planning to go... so please come by the event page and find those buttons! I just found out last night that Ruthie isn't coming now. Letting you know on her behalf. Also let's talk about when to start... nominally, it would be dawn, which is 5:30am. Full Hood climbs usually start about midnight, so if we want to be more ambitious and realistic we could leave earlier for more cold and dark time. Or we could be lazier and leave later... any preferences? My vote is for the original plan of around dawn, but if we wind up starting earlier, I'm up for it. Im okay with either. Simulating the real thing wouldn't be terrible. Sleeping a little more would be cool too! Ok, sounds like a consensus. Exact departure time has been added to the Team-Only Information above. I don't think it's any concern, especially not on the part of mountain where we will be. Are people camping the night before? I'd be down for it if anyone wants to make plans. Stoked for the climb! I was thinking of just sleeping in my car but if people wanna camp together I'll bring my tent along! I would totally prefer to camp. But the weather report is not looking very tent-friendly (40's, windy, and raining), so I'm kind of waiting to see if the outlook improves. Let's make some carpool plans... who is brave enough to go Saturday and camp out, and who is going to come up in the (very early) morning? And who wants a ride or has a spare seat? Jed and I are staying in our RV (totally roughing it ;) )in the parking lot overnight, so we're all set and will see you bright and early. I'll be going up Saturday and I've got four seats. However, you'll need to have other sleeping plans cuz I'll be sleeping in the back of my car. I'm going on Sunday morning and I need a ride. My car is not suitable to drive in snow. Anybody? Please and thank you. I'd be down to camp if there are any other ladies who want to share a tent. If not I'll keep thinking about it.. I have heard nay a peep from Katherine, Ruth, Kyirsty, or Ethan. You still in this thing? Oh I'm just lurking. Kyirsty and I will probably not be camping Saturday night. We are still planning on embarking at 0530 on Sunday, yes? Yep - plan to be there around 5 to gear up. Would you be able to pick up somebody at Sunnyside (see above) on the way up in the morning? Also you're not "verified" and we don't have emergency contact details for you, we need that... should be links on the page above. Hi Fritz! I replied to a comment of yours up above on behalf of Ruthie. I found out a couple nights ago that she is not coming. She had to leave town last minute. Hey sorry! If someone wants a ride tell them to text us! We are leaving Portland around 3. We have the pup too who will chill in the backseat. About crampons: they aren't required for this climb, but Nathan suggested that those of you preparing for Hood climbs spend some time walking in them, because it takes some getting used to. So my plan is to make a stop about halfway to put on crampons on the mountain. Please try your crampons on your boots before the trip; they usually need some adjustment. My plan includes having a beer and a snack at the Ram's Head Bar in the upper lodge around 8pm, if anyone wants to join me. Jed and I will join you!